Lasermet’s laser blocking slatted blinds are ideal for use in operating theatres and are effective in blocking all medical lasers. There is also an option for X-ray proof vision panels. Tested in accordance with Laser safety standard IEC 60825-4 and designed to fit into window and door openings in operating theatres, this highly effective and professional laser blocking.system is ideal for hospitals and other facilities where there is a need to guard against the escape of laser beams. The unit can be installed as a standard fit within the door or window aperture or it can be fitted as a flush fit where the surfaces of the unit match those of the aperture edges. It can also be retrofitted to existing doors and windows. A simple lever operates the slats within the window to either allow or block laser light from penetrating. Selecting the double sided lever option enables the blind to be operated from both sides. 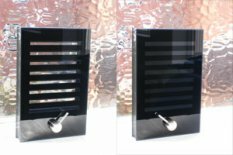 The system uses 6mm toughened glass in front of the slatted blind to prevent the ingress of dust and infection. There is an option for a motorised version that can be controlled through an interlock control system.